... 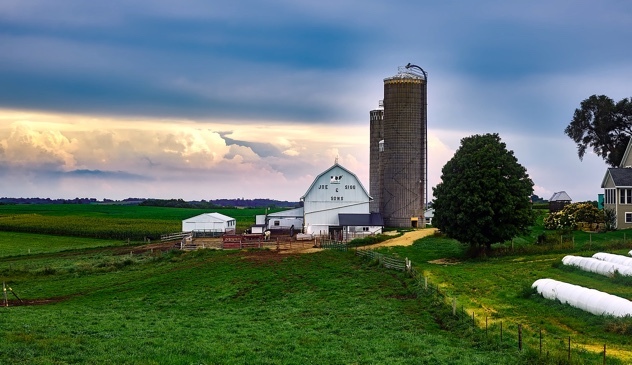 I was visiting some family in Wisconsin, land of the dairy farm. That made me start thinking about milk and a few related topics came to mind. The first thing I remembered was my experience with milk as a child. 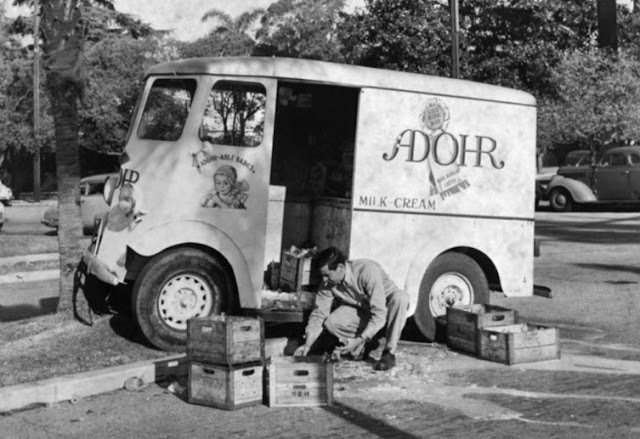 I grew up in Los Angeles in a gilded age when the milk was delivered to your home by the milkman. You'd leave a note for the milkman--say, "2 quarts whole; 1 pint cream"--and then the next morning, the order would appear. The milkman and his truck were a common early morning sight in the US, back in the day. Usually, the milkman would leave it on the doorstep, but the really nice houses had a kind of built-in receptacle to hold the milk and keep it out of the sun. But in earlier days, milk seems to have been delivered in a totally different way. Here's an image I've had in my files for a while--from an era even earlier than the days when I was a kid in LA. All of this recent milk sightings has made me wonder a few things--great SRS Challenges for us to work on this week! 1. Those milk containers (as seen in the previous image): Do they have a specific name? If I want to buy one, what term or name would I search for? Is it possible to buy new ones? 2. As I said above, some houses had a kind of mini-closet into which the milkman would put the day's delivery: What was that mini-closet called? 3. Milk delivery by dog? Seems odd to me--why use dogs to deliver the milk? 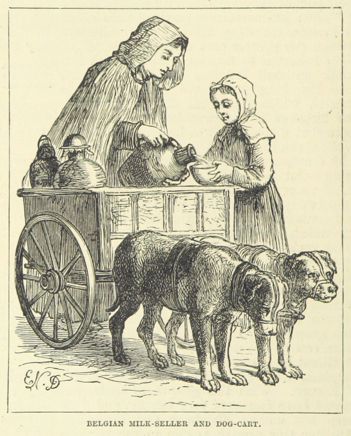 In particular, can you figure out where that image of the dog-cart milk delivery came from? 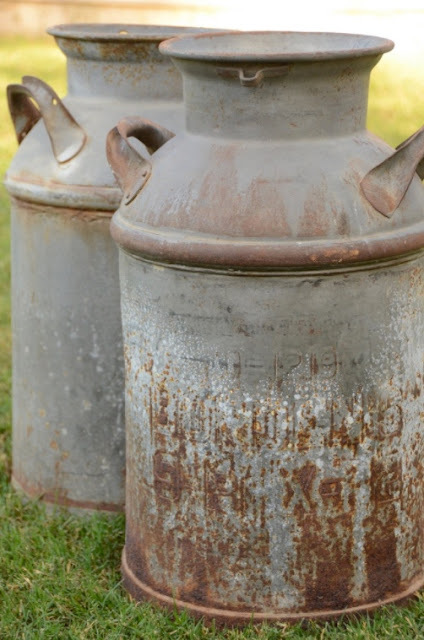 What other kinds of animals were (or are) used to deliver milk to the customer? Hope you find this dairy-focused Challenge to be as fascinating as I did! In my case, I found the remnants of two 19th century mining towns! 1. What were the names of the towns located near 37.1832161, -121.8543355 ? Where did the inhabitants come from? 2. Did these two towns have churches? If so, what denomination were they? 3. What was the most common disease / syndrome at these towns? What would you do to cure the disease / syndrome? 4. (Optional / extra credit) Can you find any pictures of these town taken at their prime? As AlmadenMike was the first to point out, this photo location is in Almaden / Quicksilver County Park. 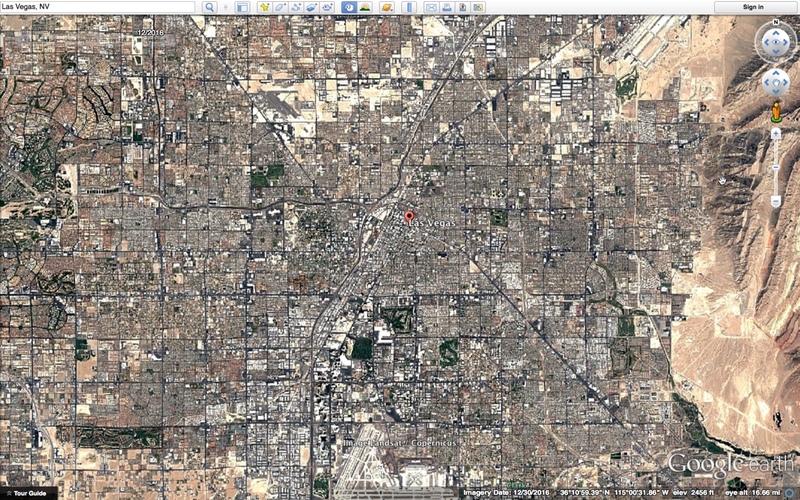 Just drop that lat/long into Google Maps and you'll find that out. 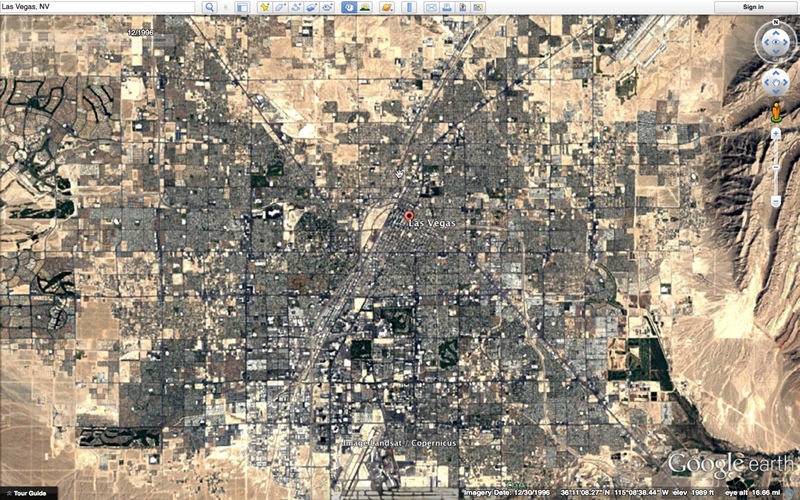 When I'm doing historical and location-based research like this, I like to look at the place on a map. You'll often pickup clues (placenames, etc.) that can be useful in future searches. 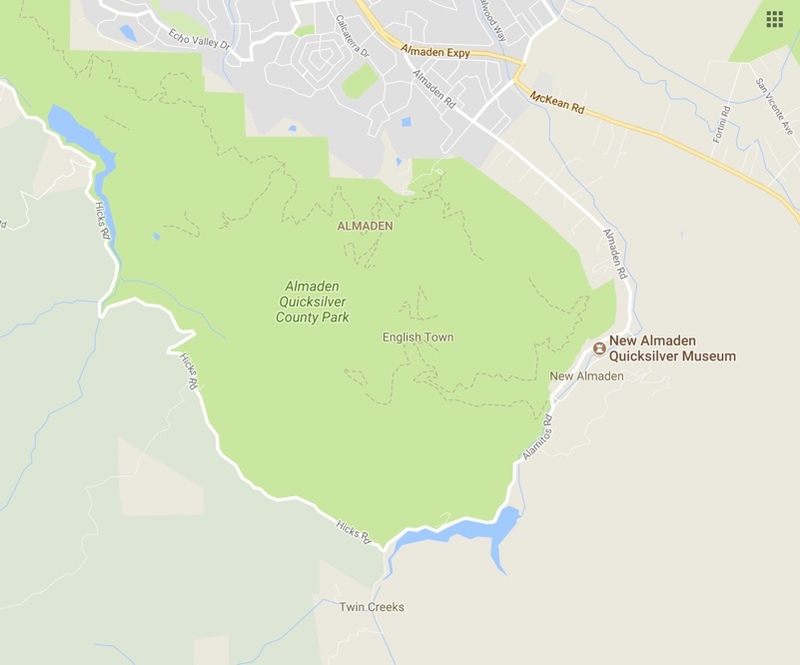 When I did this, right away I can see two places that might be useful--"English Town" and the New Almaden Quicksilver Museum. In this same first-pass search, I found a link to the New Almaden Wikipedia page, which mentions both "English Camp" and "Spanishtown." "English Camp" is described as having "....housing for the up to 1,800 miners, [which are] are scattered about the park, with the biggest concentration at what was known as English Camp, established by Cornish miners in the 1860s." 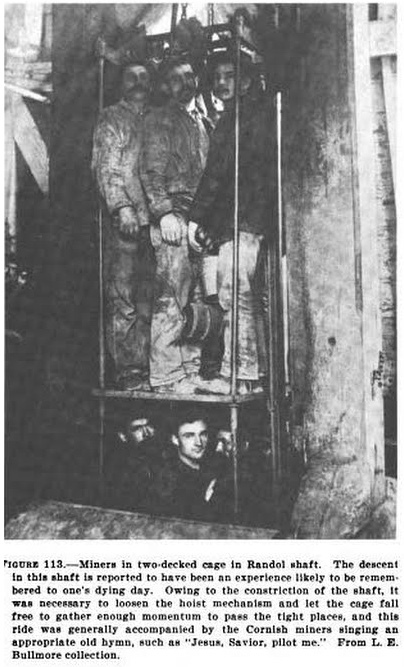 In the fall of 1847, Alexander Forbes arrived from Mexico with a large crew of workers and equipment, and with John Young, who would superintend the operation.... Next, workers built small houses over several low ridges in a large, open ravine. 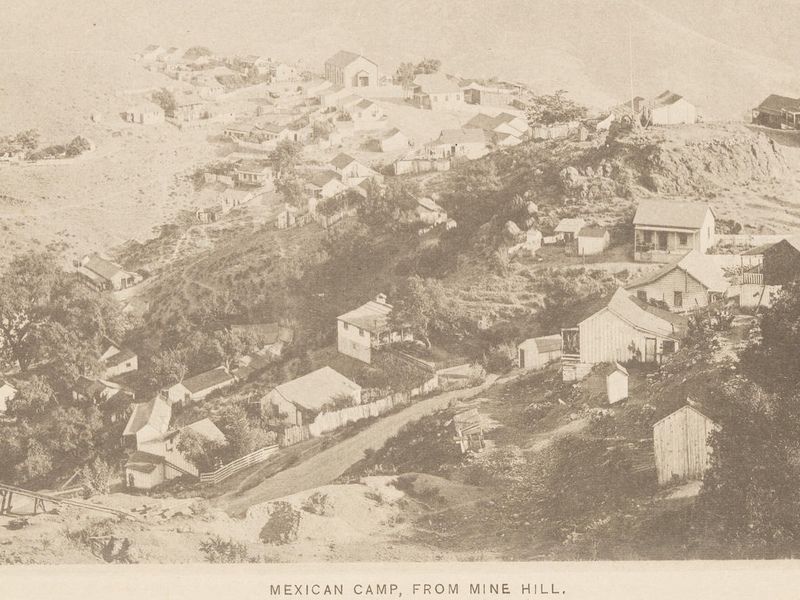 The ravine area, known as Deep Gulch, became the location of the Spanishtown settlement, which accommodated the Mexican mining crews and their families. Eventually, three settlements would exist at New Almaden: Spanishtown, Englishtown, and the Hacienda. Spanishtown was the largest of the three. The majority of Spanishtown's people were married and in their younger years. Mexican labor and Spanish/Mexican mining technology developed the New Almaden Mine during its early years. Most of the early miners were imported from Sonora [Mexico]; their numbers were increased by native Californios and some Chilenos..."
This explains where the Spanishtown miners came from--mostly Mexico, some local Indians (Californios), and Chile. What about "English Town" or "English Camp"? Where did those folks come from? 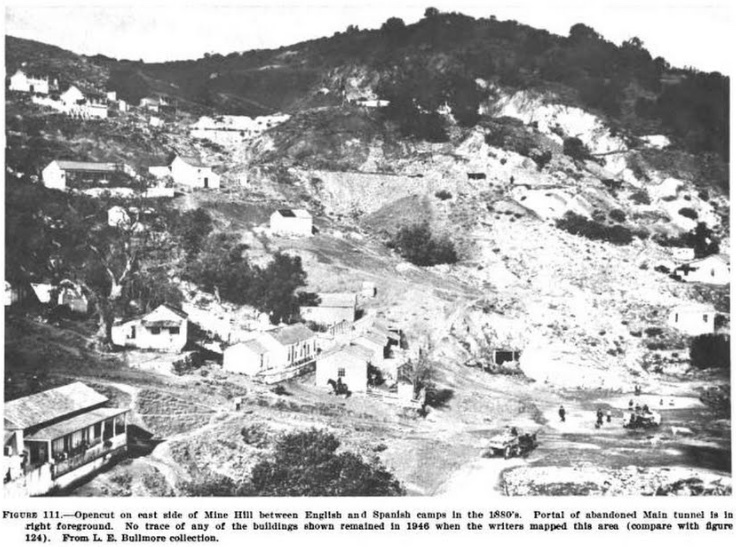 That first Mercury News article mentioned "Cornish miners" and the Wikipedia article about New Almaden tells us that around 1800 Cornish miners were settled there by the 1860s. 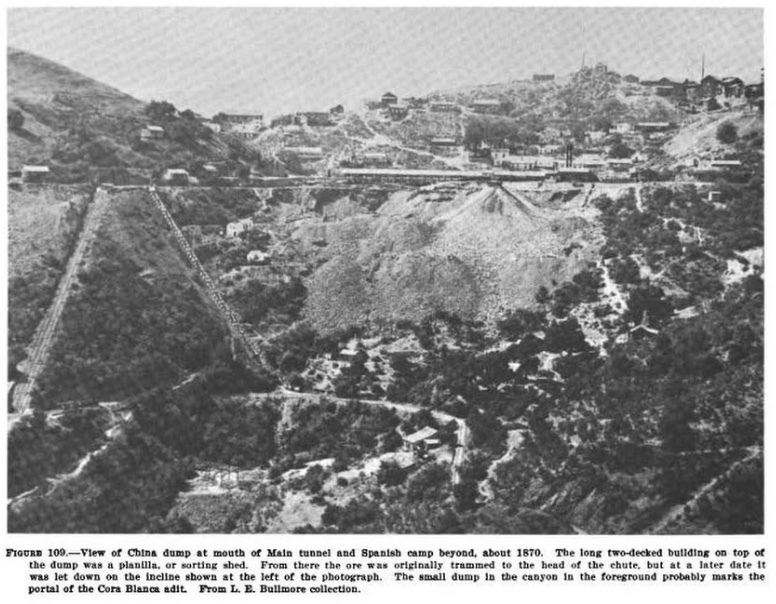 "..an English Camp, largely populated by Cornish miners trained in the Almaden mine in Spain, had grown up around the company store on Mine Hill. Apparently there was little, if any, friction between the Mexicans and the English. Each group recognized the other's special abilities; the Cornish miners were experts on sinking shafts and running long straight drifts, whereas the Mexican miners excelled in following and mining the ore...."
Amazingly, this book also has an image of both English Camp AND Spanishtown. 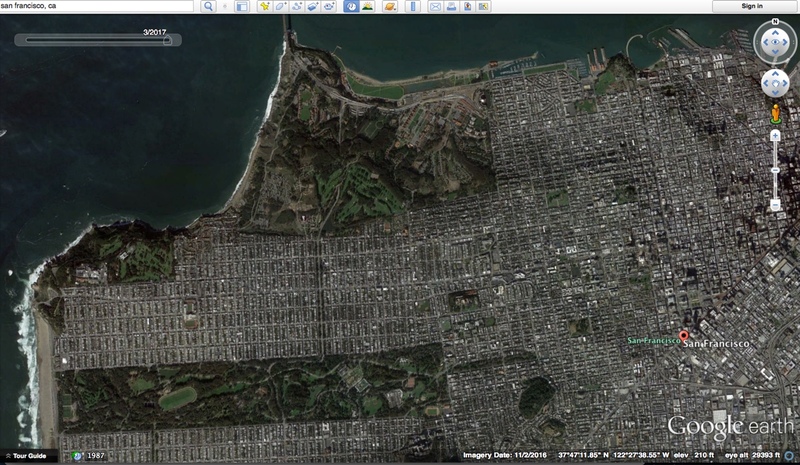 It's a bit hard to see in this image, but you can see some of the houses for both locations. Jesus, Savior, pilot me,Over life’s tempestuous sea;Unknown waves before me roll,Hiding rock and treach’rous shoal;Chart and compass came from Thee:Jesus, Savior, pilot me. It's really a mariner's hymn asking for protection from unknown dangers, but just as applicable for miners descending on a sketchy elevator into the wave of rock that makes up the Almaden mine. Are there more good pictures to be had of English Camp? I went back to the SERP of my previous query and followed a link to a different book The New Almaden Quicksilver Mine (1964), which told me that it had a "Bird's-eye view of English Camp"! Sounds promising... but that book isn't in Full View mode, and you can't see the picture. Hmmm. I really want to see that image, so... what to do? Answer: Search for that image title. 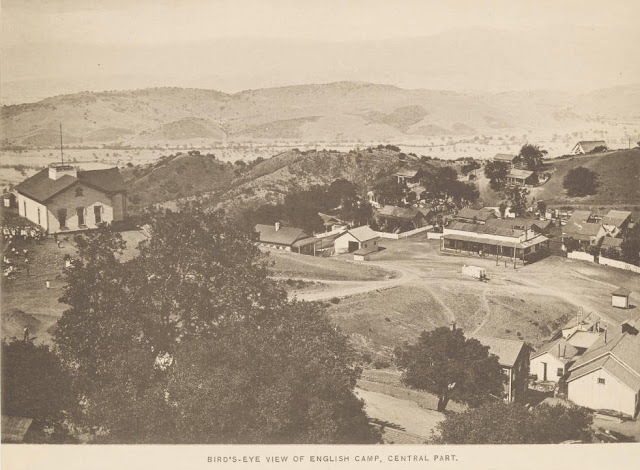 Bird's Eye View of English Camp, ca. 1885. P/C: Photographer: Bulmore, Robert R.; Winn, S. W. In the Bulmore-Winn Album. Held at the DeGolyer Library, Southern Methodist University. This image is part of the Views of New Almaden album, which is full of wonderful images of the mine and the area nearby. Looking at this image you can see the church just above "Mexican Camp," the building near the hillcrest with the faint cross on top. We've done nearly all of the Challenges. We just need to identify the church denomination (and check to see if English Camp had its own church), and find a hospital (if any). "...there is a Catholic church in Spanishtown and a Methodist Episcopal church at the English camp. A Methodist minister resides at the camp. The Catholic church is attended on Sundays and great holidays by a priest not resident at the place." "The sanitary department is represented by a resident physician and surgeon, assisted by a competent druggist and a complete drug store..."
"Hospitals.--2 hospitals are provided, 1 in the English camp and 1 in Spanishtown, although their use is very rarely required. Nurses are paid for from the miners' fund..."
This entire section is fascinating, but I found the section entitled "Physician's Report at New Almaden for the Year 1890" section to be really interesting. It points out that they had 33 cases of "mercurialism" (10.44% of all miners). And, "The above table [of data] shows a decided difference in the salivation rate at the mine in comparison with that at the works, and, being so remarkable, is well worthy an inquiry as to its cause." There's a short analysis that points out how different the work is between miners (who have extended direct contact with the ore) and the "works," where the work is very different (it's primarily office work). This is fascinating. But what are mercurialism and salivation rate? A quick [ define mercurialism ] tells us that it's "..chronic poisoning with mercury (as from industrial contacts with the metal or its fumes)—called also hydrargyria, hydrargyrism." At a quicksilver mine, there are plenty of both fumes and mercury metal. That makes sense. But now, when I do [ define salivation rate ] I get all kinds of definitions of salivation. BUT... I noticed that result #5, from Dictionary.com mentioned calomel. Remember calomel?? We ran across it in our earlier SRS Challenge about "Mercury where?" If you click on that link, you'll read in the second definition: "verb (used with object), salivated, salivating. 2. to produce an excessive secretion of saliva in, as by mercurial poisoning." And what was the treatment for mercurialism / excessive salivation? If you keep reading in that book, you'll find that the best treatment is, of course, avoiding exposure... and the "use of a saturated solution of potassium chlorate as a mouth wash after the slightest exposure..."
hoping to find its use at the time as a therapy for mercurialism, and was rewarded by finding Sajous's Analytic Cyclopedia of Practical Medicine, Volume 7. On page 582 you can find the recipe for a potassium chlorate mouthwash that's recommended for treating "mercurial salivation." 2. Remember to use cache: operator when you want to get to a backed-up version of a web page that's missing. The National Park Service is going through difficult times these days and don't seem able to keep their web sites working. So when a page you want to read goes dark, remember this trick. 3. Read carefully, noticing things that seem a bit different. We have two cases where the text that "sticks out" was important. 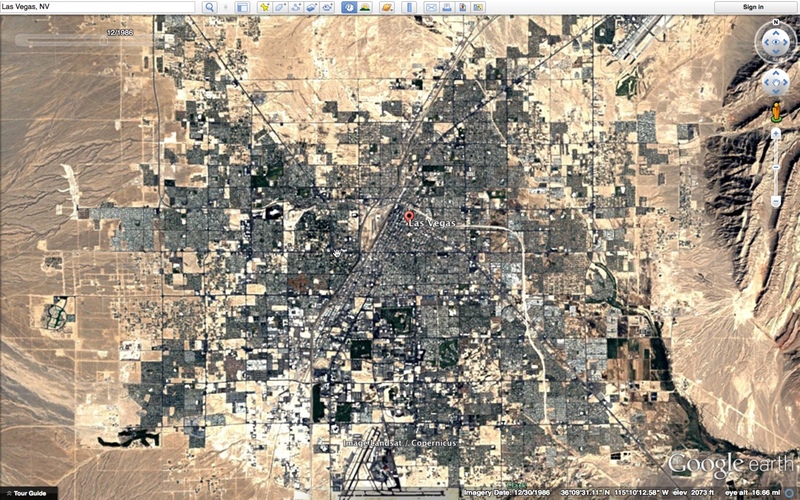 The image we couldn't see labeled "Bird's-eye view" was a big clue about how to search for that particular image. Also, the use of "salivate" as a verb--that should make your SRS antennae go up! 4. Sometimes you have to know stuff--or be willing to search it out. In that definition of "salivate" we noticed the word calomel, which was a huge tipoff that mercury poisoning was involved in the production of excess saliva. If you see a strange word like that... take the time to look it up. The chance that this will prove to be useful is pretty good. 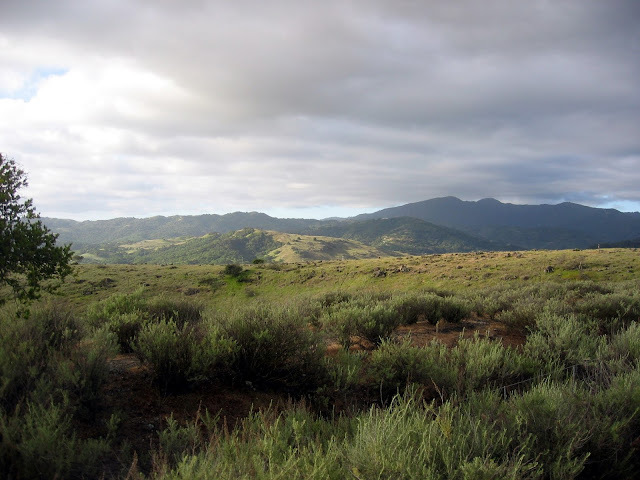 A great page to read about the New Almaden area in general, with lots of geology background is Andrew Alden's page about New Almaden and mercury at KQED's Science blog. ... and once upon a time, I used to run the trails in these hills. Near where I took this picture, there's the vestige of an old town that I've run through many times. In fact, there were two towns near this place, both named for the commonplace languages of the people who lived there. I'd like to learn more about these two 19th century towns, but they're not listed as official places any more! What do I do? 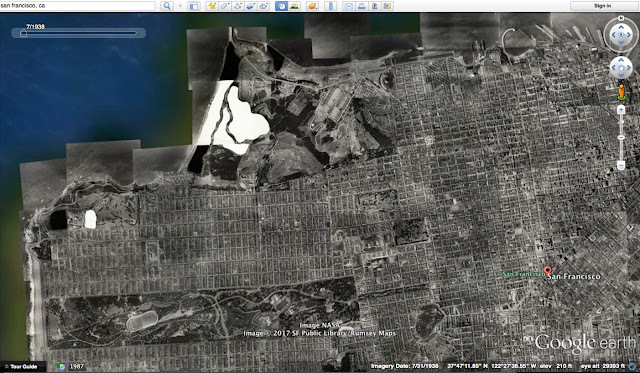 An important SearchResearch skill to have is the ability to find information about places (and the inhabitants) of locations that no longer exist. Both of these towns flourished in the 19th century. There are still some ruins (I've seen them! ), but not a lot of information. Let's focus on just a couple of pieces of information about the people who lived there over 100 years ago. 1. What were the names of the towns? And where did the inhabitants come from? This requires a bit more than the average SearchResearch skills--but it's not crazy hard. (Just slightly insane.) Still, you should be able to do it! Go forth and see what you find! Answer: An important plant that's now extinct? So.. was it a real plant! The book I was reading told me this plant existed in Ancient Rome, and was so valuable that it was depicted on ancient coins as an emblem of wealth. Strangely, It was valuable partly because it was used as both a medicine AND as regular kind of seasoning. It could also be that part of the reason it was so valuable is that it was fairly rare. Yet, remarkably, this plant somehow vanished--it seems to have totally disappeared from the earth. What? It's a plant... wouldn't some enterprising farmer have figured out a way to grow it (and earn millions of denarii in the process)? We know it was used all around the Mediterranean, and yet somehow, it slipped from our collective horticultural fingers. Can you solve this 2000 year old cold-case? 1. What was this plant? How is it possible that we no longer grow it? This query seems to have hit the jackpot. 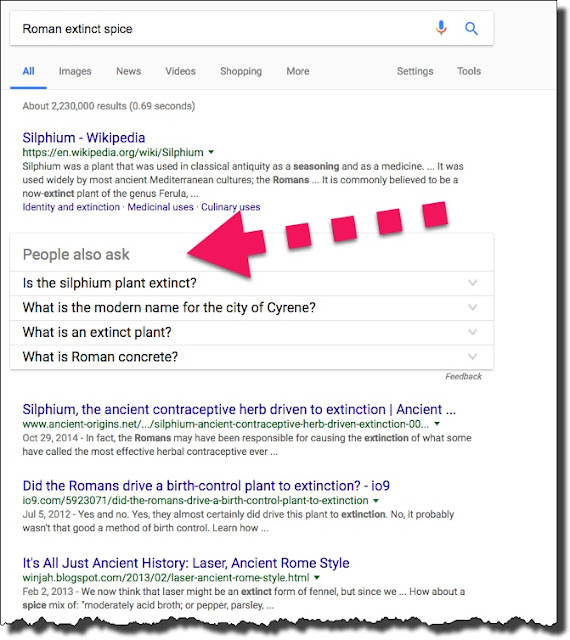 Not only does it suggest that the plant is/was Silphium, but it even has "People also ask" suggestions (note that this feature is currently only available in the US--if someone outside the US would try it with Google.com/NCR and let me know if it works, I'd appreciate it). These "People also ask" suggestions are questions that lots of people ask that are associated with this query. Note that the very similar query [ Roman extinct plant ] doesn't generate this "People also ask" list--just the fairly specific [ Romain extinct spice ]. There are a couple of things to notice in the combination of the "questions" and the "related searches." First, the connection between silphium and extinction seems pretty clear... and that it's a common question people ask. Second, there seems to be a connection between silphium and contraception. Third, there seems to be something about "laser" associated with silphium. I assume that's not the modern "laser," but something else. This article is about the plant that was used in classical antiquity. For the modern genus of plants, see Silphium (genus). Not to be confused with Silpium. The Wiki article (and several of the others on the first page) seem to agree: Silphium WAS a plant from the North African city of Cyrene (in Libya), and was so critical to the Cyrenian economy that most of their coins bore a picture of the plant or its heart-shaped seeds. Cyrene coins with the seeds (heart-shape) and plants of the Silphium. The valuable part of the plant was its resin (aka laser, laserpicium, or lasarpicium), collected by cutting the plant, gathering the sap, and drying it out a bit to form a kind of gummy resin. “One ancient contraceptive might have been so effective that it became extinct. This is believed to have happened to silphium (a species of giant fennel, Ferula), which was widely used as an oral contraceptive in the Greek world and in the ancient Near East. Overharvesting caused its price to rise and by the first century of the modern era it was described as worth more than its weight in silver. Part of the difficulty was that it grew only in a thirty-mile band along the dry mountainside facing the Mediterranean sea and attempts to expand its rate of cultivation failed. By late antiquity it had become extinct. … Silphium has a widespread reputation as both a contraceptive and an abortifacient. The standard prescription was for a woman to drink the juice from a small amount of silphium, about the size of a chickpea, with water once a month. It was also used as a menstrual regulator, a euphemism in many an ancient herbal book for abortifacient. Other forms of Ferula that are not extinct were also used and have been tested in modern laboratories, but they were not as prized by ancient peoples. One such form is asafoetida (Ferula assafoetida), which was a common substitute for silphium in the ancient world. Its root sap is what gives the modern Worcestershire sauce is distinctive aroma. Crude alcohol extracts of asafoetida and a related plant, Ferula orientalis, have been found to inhibit plantation of fertilized ova in rats, and these plants… seem to have been an effective means of birth control in humans." If you read through all of the articles, you'll see there's some debate about this. Did it REALLY work as a contraceptive? So why did it become extinct? As I read through the articles, there are plenty of speculation about why it went extinct, but the common theme in all of the stories is that it was a kind of tragedy of the commons. Since the plant would only grow along this stretch of the Libyan coast, AND because nobody was able to figure out how to cultivate it (which is true of some spices! ), once that stretch of the coast was over-harvested, that was it for the silphium. Gone. Next to be described is the laserpicum, which the Greeks call silphium, a plant of outstanding significance that was discovered in the province of Cyrenaica. Its juice, called laser, is an important source of nourishment and medication, and worth its weight in silver denarii. But it has not been found in Cyrenaica for many years now because the contractors who rent the fields for pasture, realizing where the greater profis lies, wipe out the silphium by grazing flocks upon it. A single stock is all that has been found there in my memory, and it was dispatched by Emperor Nero. If ever a flock does happen upon a sprout of it, they give themselves away after eating it—a sheep by falling asleep on the spot, and a goat by a fit of sneezing. Again, you have to be cautious about what Pliny writes, but this story sounds plausible. It was grazed out of existence. Of course, it's possible there are still some around... but the coast of Libya has become increasingly desertified since Pliny's day, so I'm willing to bet it's really extinct. So... what's a reasonable substitute these days? It's hard to know what silphium tasted like. Members of the Ferula (fennel) family run the gamut from a licorice-like taste to celery. So perhaps we'll have to go with the asafoetida. I've got some in my kitchen (it's used today in Indian cooking), and I have to say it doesn't exactly scream 'add me', as it smells like an robustly pungent garlic/leek/onion mind-meld. Luckily, when cooked, the flavor is more like a combination of these three ingredients, and adds a rich, savory background taste to food. Asafoetida is never used by itself, and is instead added to help pull together the other ingredients in a dish. Luckily, Asafoetida is readily available; just check the spices at your local supermarket. 1. You can pick up useful search concepts and terms by looking at the related questions and related searches. Be sure to pay attention to these, as they'll often give interesting directions for your research to follow. 2. Sometimes you end up with an unreliable narrator. 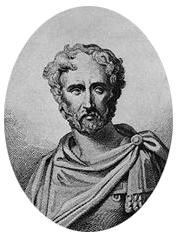 Nobody really believes everything that Pliny the Elder wrote (at least not now). But such sources can be useful for understanding what people believed at the time. And that's frequently what you want when doing historical research. 4. When you read multiple and different versions of the same story, be cautious. It's hard to figure out what really went on 2000 years ago. Stories tend to diverge and become more varied with time. That was a fun SRS Challenge! Thanks for all of your comments. Excellent work, team! Remember our ongoing discussion of the Farallons? 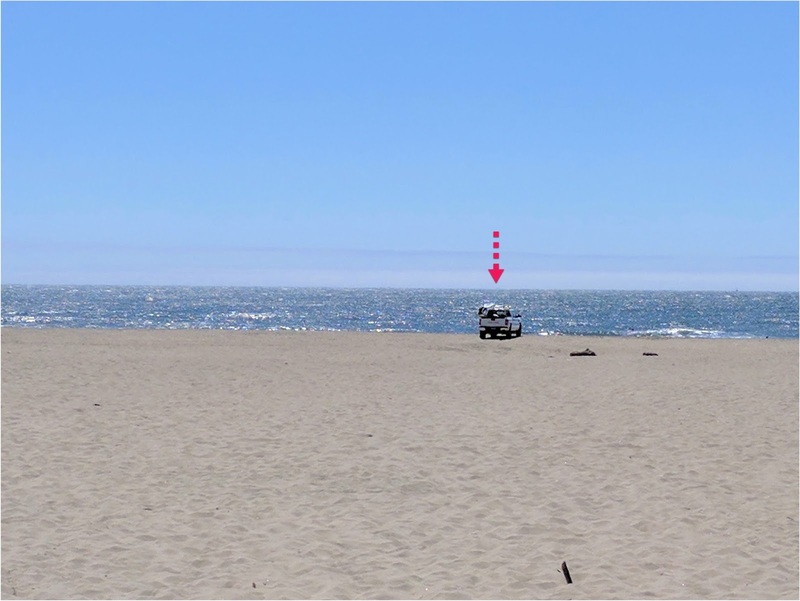 (Can you see the Farallons from San Francisco)? I finally got to the beach to check it out on foot, IRL. 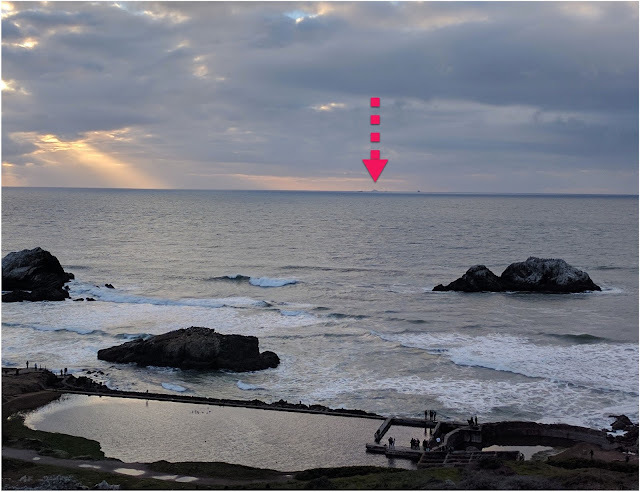 As a reminder, here's a shot of the Farallon Islands from the parking lot at Sutro Baths (about 250 feet above sea level). See those bumps just on the horizon? Those are the Farallons! Earlier this week, I happened to be driving past the Sutro Baths and took this opportunity to take a picture from the nearby beach. As I drove down the hill, I watched the islands disappear beneath the horizon. 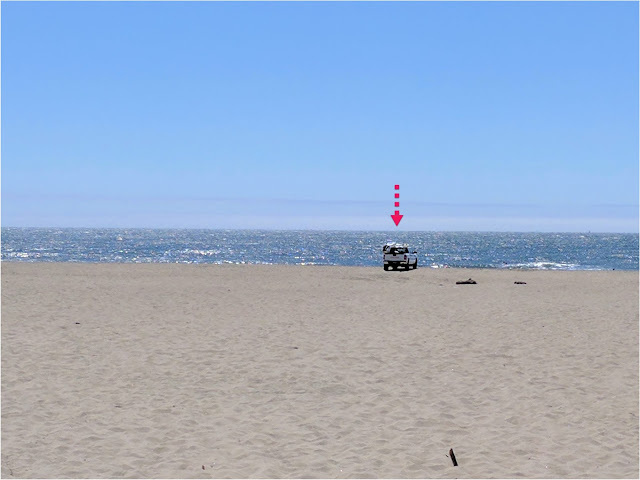 The arrow marks the spot where the islands should be on the horizon, if only they were visible from 6 feet (ca. 2m) above sea level. Looks like our calculations are just about spot-on. Answer: How can you see across time? ... at the same time? That's really the essence of this Challenge. My goal is to allow for easy comparisons between an A and B version of photographs taken from the same place. The question was, how can I do this for real? quickly leads you to the CatchMyFame site which has a nice demo of their slider function. I copied the HTML of their web page and dropped in the two images from above (did a little hacking to fix up a few things that have changed over time). And I made this web page (which almost works correctly--something changed in the dragging code) so you can CLICK either to the left or right and get the same effect. At some point I'll get around to fixing the non-working draggable slider. I'll announce it here. But I didn't want to hold up this post while was futzing around. To see how this works live, CLICK HERE to visit the page (for weird technical Blogger reasons, I can't embed my running HTML example in a blog post, so you have to get it directly from my site.) Note that the slider will move to where you click, so if you click near the slider, it will move a little bit. If you click farther away, it will move a large distance to get to your click point. #2. I can make a movie that lets you use the scrubber to do something very similar. Here's an example of what I mean. Watch this short video to see how you can use the scrubber (the control that lets you move forward and back in a video) to see the change from 1938 to 2017. This video (you can download it by clicking this LINK to slider-example video). Once you have it, you'll see that it lets you scrub back and forth just by dragging the time position widget (often called a "scrubber") back and forth. If you're interested, you could do the same thing with a "fade" transition, and then you could select any degree of transparency between the two images. #3. 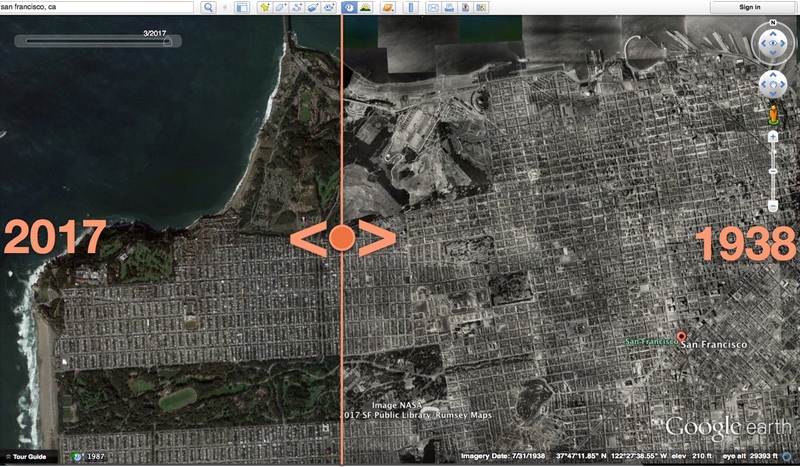 You can use the browser's back/forward commands to do "blink comparisons" of a place! All I did was to open these 4 images that I opened in my browser. (If you click on them, they'll open up full-size, then you can load them into your browser just as I did.) Notice that the date is show in the upper-left corner in the URL bar. I named each image with the year the photo was taken. Special bonus: If you use the right-arrow after you've opened the image, you can skip forward in time. Left-arrow takes you back. Try it! Of course, you can do a few screen-grabs of your own and use this method to do a quick time lapse of any place you'd like. 2. In this same vein, I'd like to see a nice time lapse of a place--ANY place. 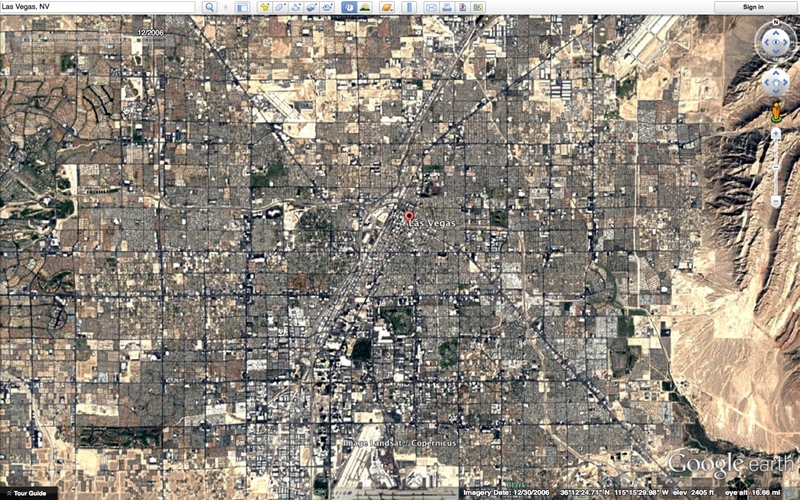 (You can probably find an aerial time lapse of any particular large city.) Can you find a worldwide tool that will let me see any place on the planet with a roughly 10 year timelapse view? This last answer to the Challenge gives us a good idea about a possible solution! 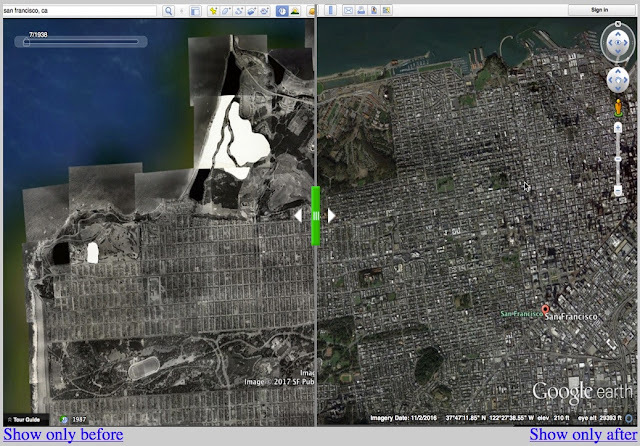 and was gratified to find that Google Earth has a special version web-application--Google Earth Timelapse--that let's you fly to anyplace on earth and get a decent time-lapse aerial image for the past decade. The default demo is for Miami, Florida (which is pretty impressive), but there's a lot to see (and be worried about). The biggest lesson here is that there are many ways to accomplish the same thing.